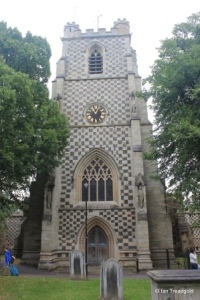 The imposing parish church of St Mary in Luton is situated to the south-east of the centre of town near to the main shopping area and railway station. 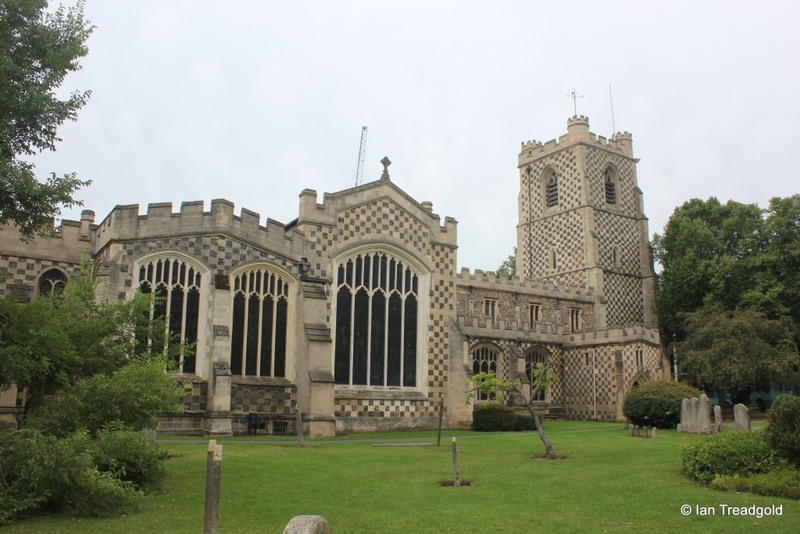 Surrounded by ring roads, the University of Bedfordshire and the shopping precincts, St Mary provides an oasis of calm in a busy urban environment. Parking is in town centre car parks. 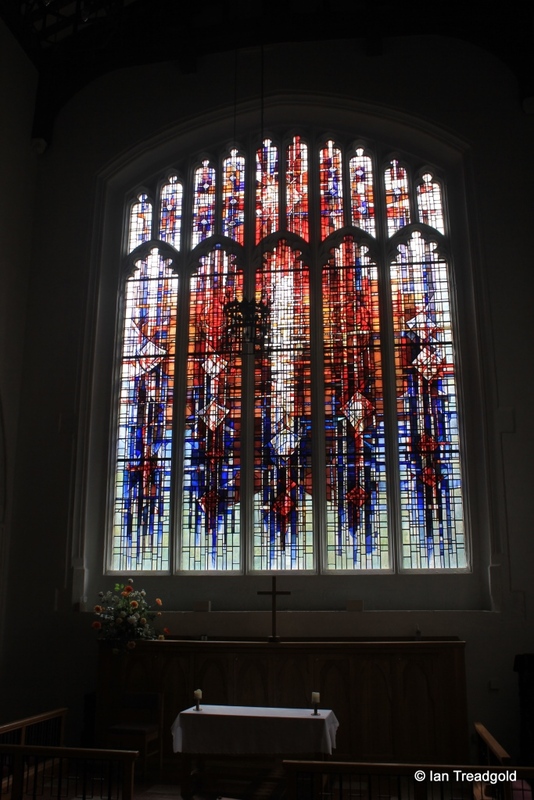 The church is cruciform in plan and whilst not unique, is certainly unusual. 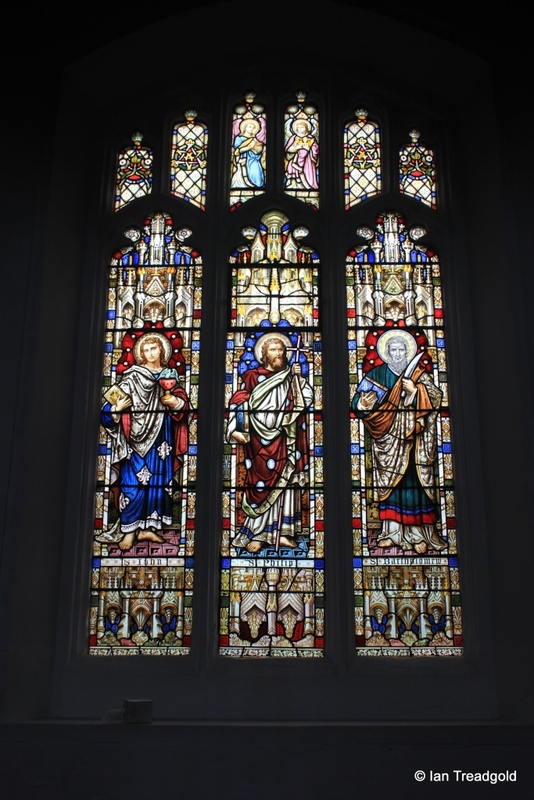 The church has a nave and chancel, north and south aisles, transepts and porches, a west tower, two storey vestry, chapels and a baptistery. The chancel and nave are around 150 feet in length, and, with the aisles, the church is around 51 feet wide. 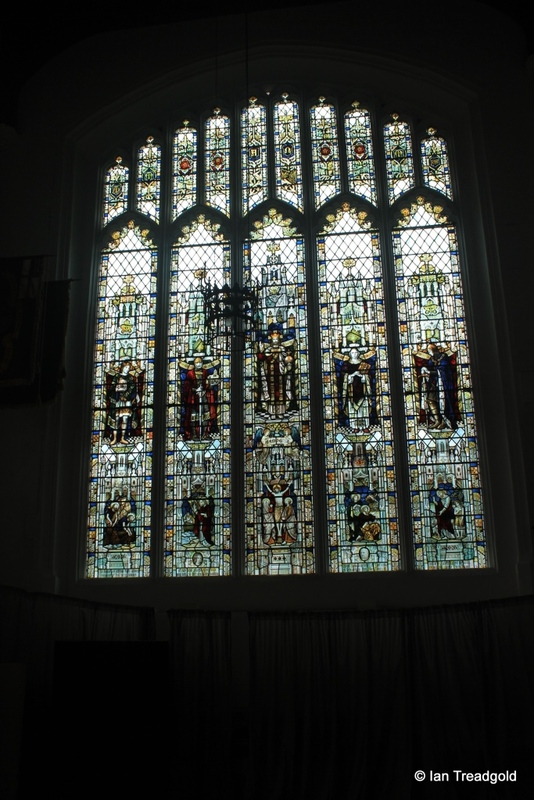 The nave is the longest in the county. The crossing is some 95 feet and the tower is around 18 feet square and 90 feet in height. 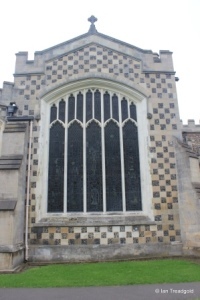 Externally, much of the church is of flint and stone chequer-work, similar to that of Chalgrave and Houghton Regis. Evidence shows that there was a church on this site in the mid C12 with a nave, chancel and crossing with a central tower. During C14 a general period of enlargement led to the tower being built in its present western location with the aisles following. 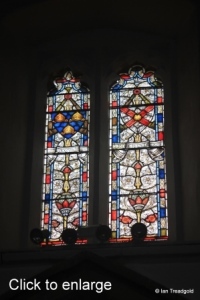 The transepts were enlarged and what are known as the Sommeries or Wenlock and Hoo Chapels added along with the two porches. 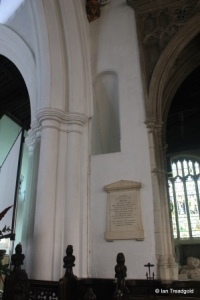 In C15 the striking double arch between the Wenlock Chapel and the chancel was inserted. Much restoration took place in the latter part of C19 and continued into the early C20 with roof repairs and restoration of the tower. 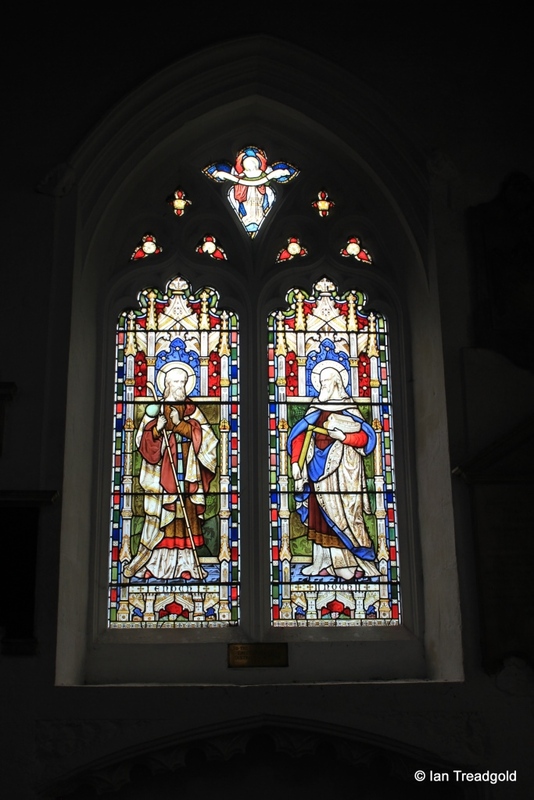 The south aisle has four windows, one to the west, one to the south-west of the porch and three to the east. 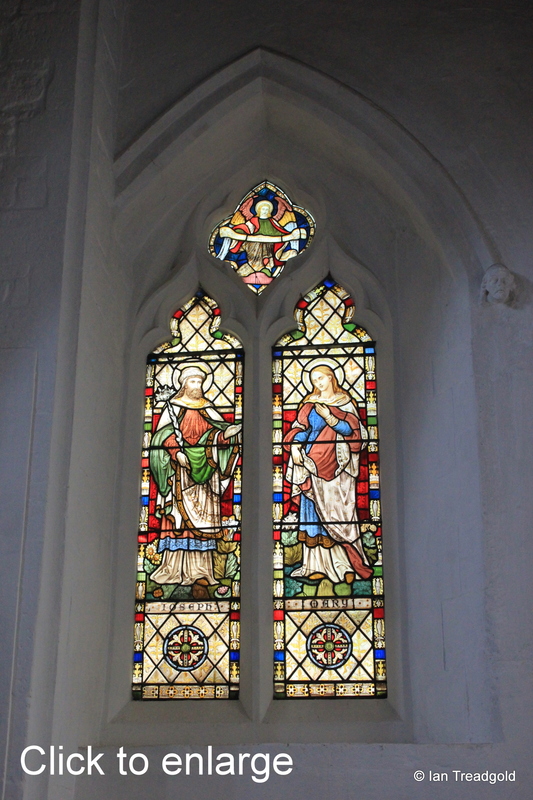 The west window is of two cinquefoiled lights with a dagger souflet under a pointed arch. 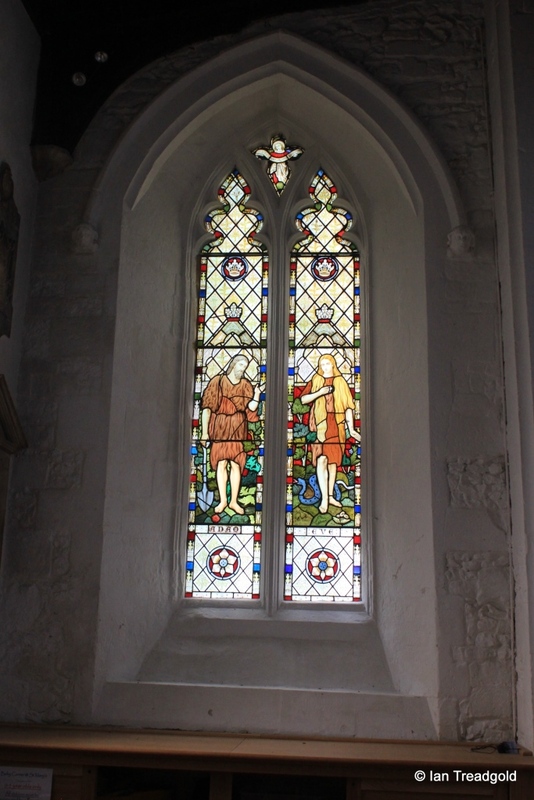 The glass in this window depicts Adam and Eve in the Garden of Eden. 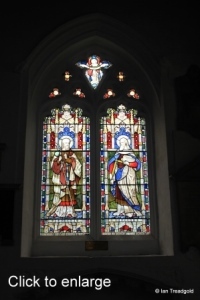 The south-west window of the south aisle has two wide cinquefoiled lights with curvilinear tracery under a two-centred arch. 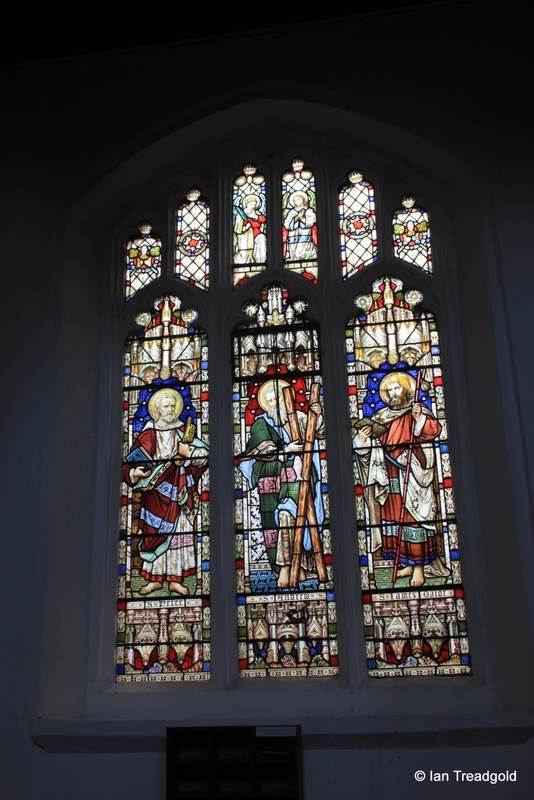 The glass in the window shows Enoch and Noah. 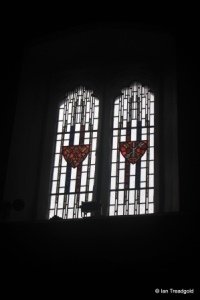 The two storey south porch has single ogee headed lights on both sides with a window of three trefoiled lights under a square head in the parvise or upper floor. 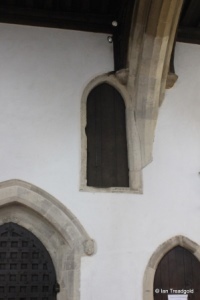 There is a round stair turret to the west of the porch in the angle between the porch and the aisle which also gave access to a gallery in the aisle, now removed. 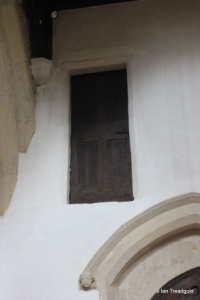 Inside, the entrance to the stair turret is clear and there is also another door that would lead from the parvise presumably to a gallery long removed. 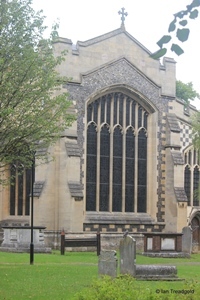 Between the south porch and the south transept, there are three windows, all of a similar style being of three cinquefoiled lights with perpendicular tracery above under a tudor arch. 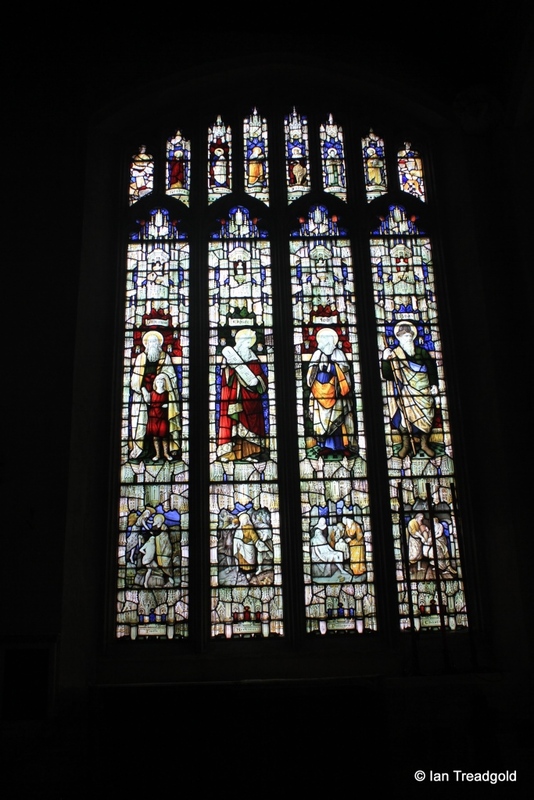 The windows depict, from the west, Abraham, Melchizedek and Jardo, Moses, Aaron and David, and, Samuel, Eli and Elijah. 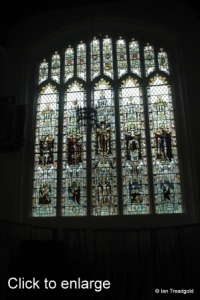 The clerestory above has five windows on each side. Each is two cinquefoiled lights under a square head. 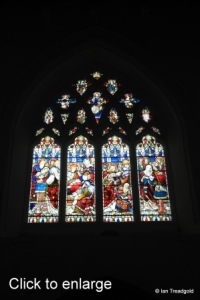 The windows to the south have small areas of stained glass depicting coats of arms whilst those to the north are much more ornate commemorating English cathedrals; Manchester, Lichfield, Ely, Chester, Norwich, Rochester, Lincoln, Salisbury, Gloucester, Bristol and Hereford. 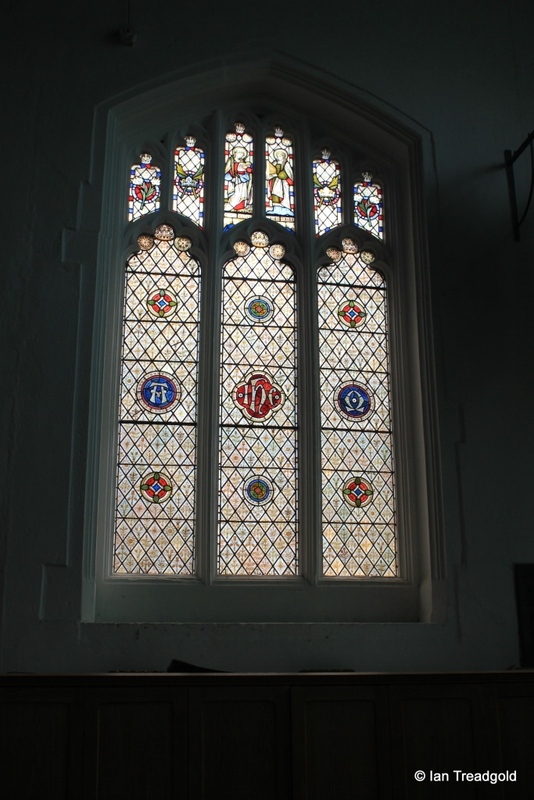 The spelling of Norwich is interesting as the N is reversed – can you have typo’s in stained glass? 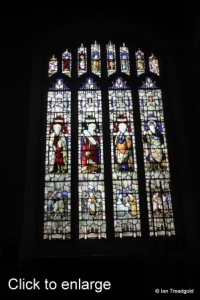 The south transept has windows to the west and its main south window. 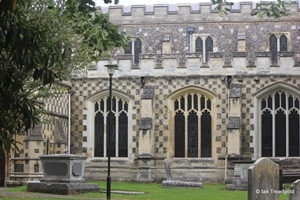 To its east is the Hoo Chapel. 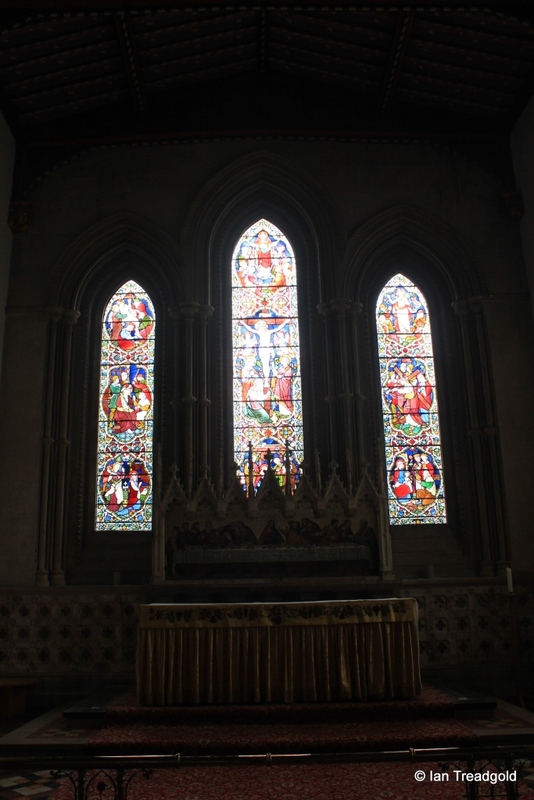 The west window of the south transept is of four cinquefoiled lights with perpendicular tracery above. 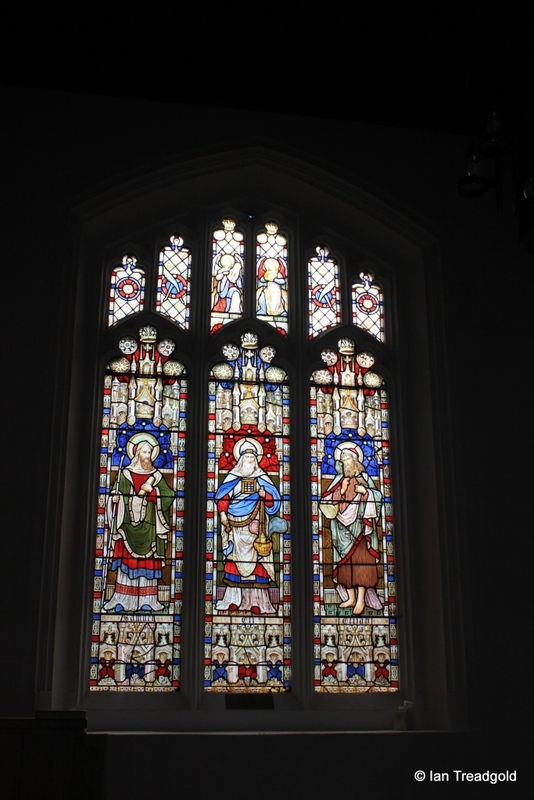 The glass depicts. 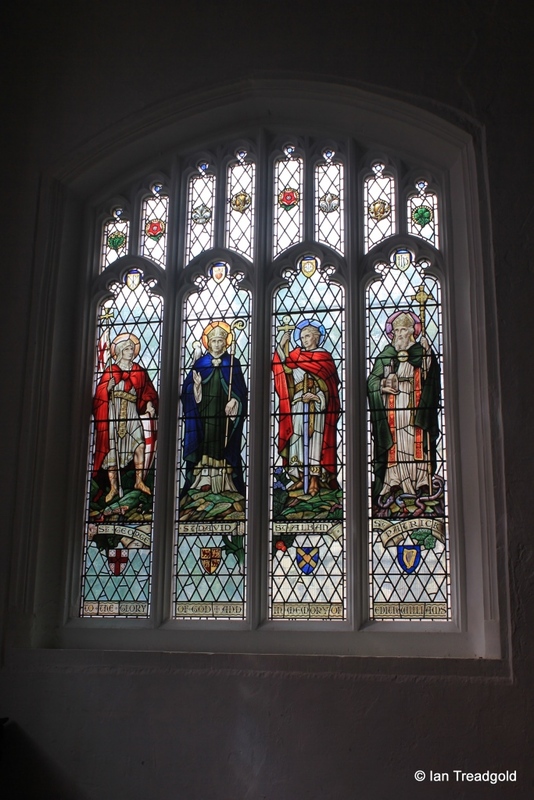 St George, St David, St Alban and St Patrick and was inserted in memory of Edith Williams. 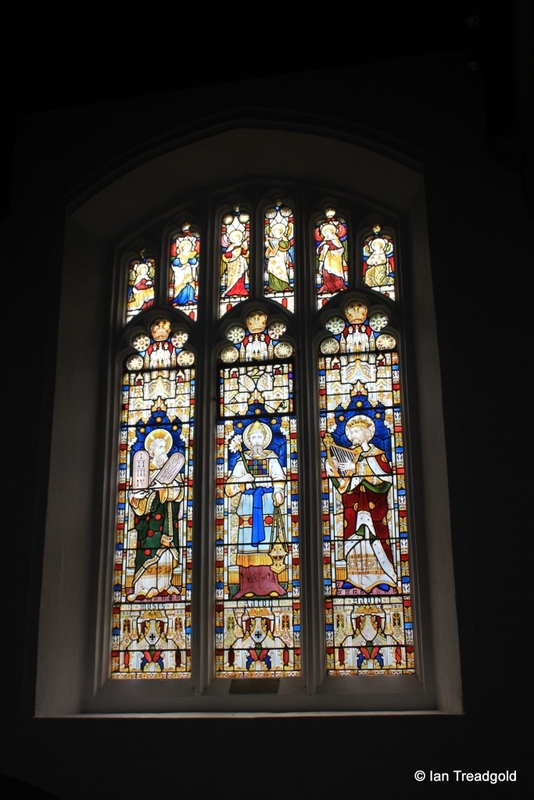 The great south window of the transept is one of the gems of the church. 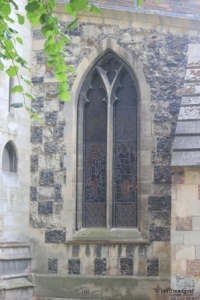 The window is of five cinquefoiled lights with perpendicular tracery above under a four-centred arch. 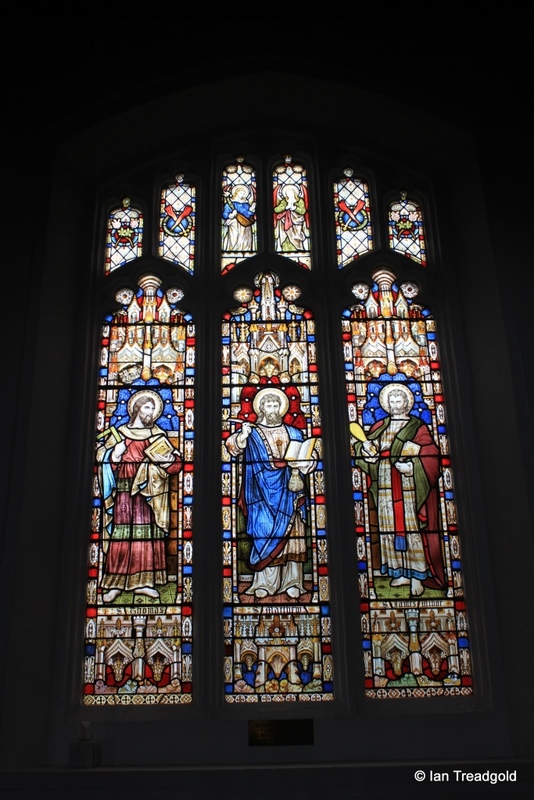 The glass in the window is known as the Magnificat Window and was installed in 1979 to replace a C19 window that was in poor condition. 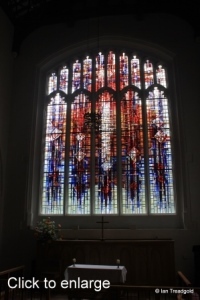 The artist of the window is Alan Younger and his abstract design aims to suggest Mary’s “explosion of happiness” and “outpouring of gratitude. To the east of the South Transept is the Hoo Chapel, now the organ loft. 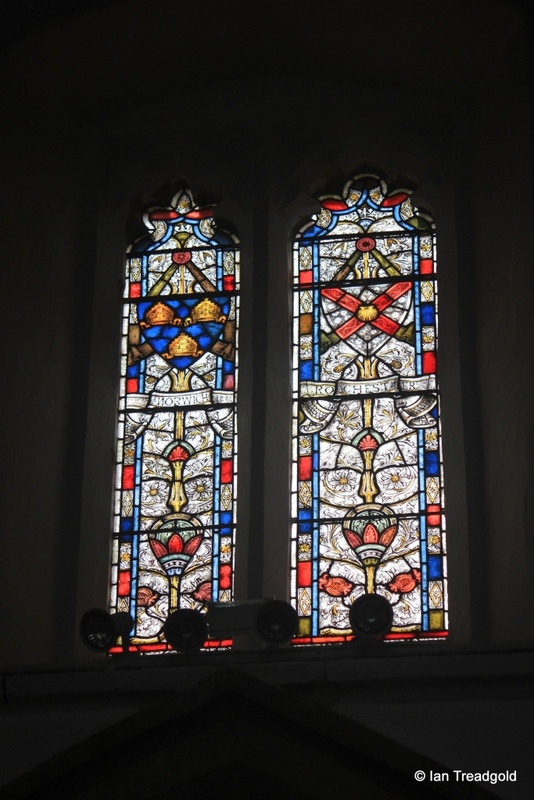 There are similar windows to the south and east, each of three cinquefoiled lights with perpendicular tracery under four centred arches. 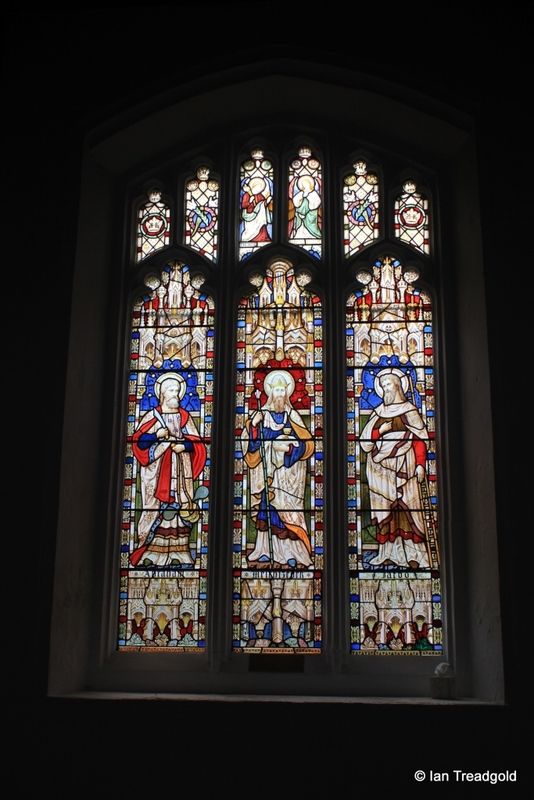 Patronage of the Chapel was from the Marquess of Bute, owner of the estate at Luton Hoo south of Luton. 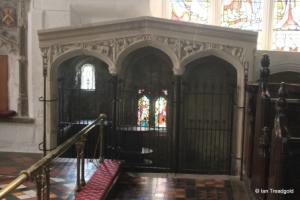 The Bute gallery or pew occupied the west end of the chancel and was accessed by a door on the south side of the Hoo Chapel. 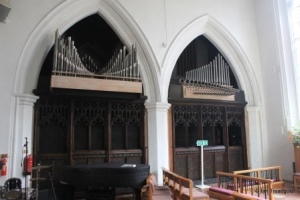 The organ was formerly in the Wenlock Chapel and dated to 1889. 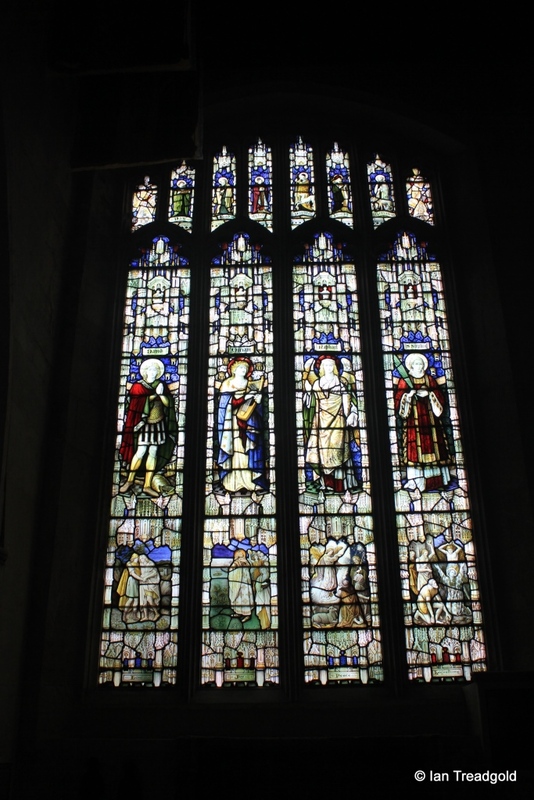 It was added to in the early C20 and moved to its present location in 1970. 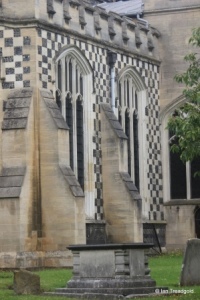 An interesting touch is the angle of some of the trumpet stops which protrude into the transept. 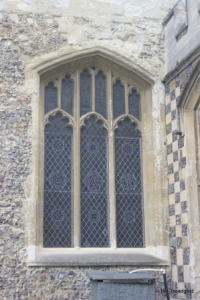 The south side of the chancel has two windows. The western is of four cinquefoiled lights with perpendicular tracery above featuring quatrefoil designs under a four-centred arch. The glass features scenes from the life of Christ. 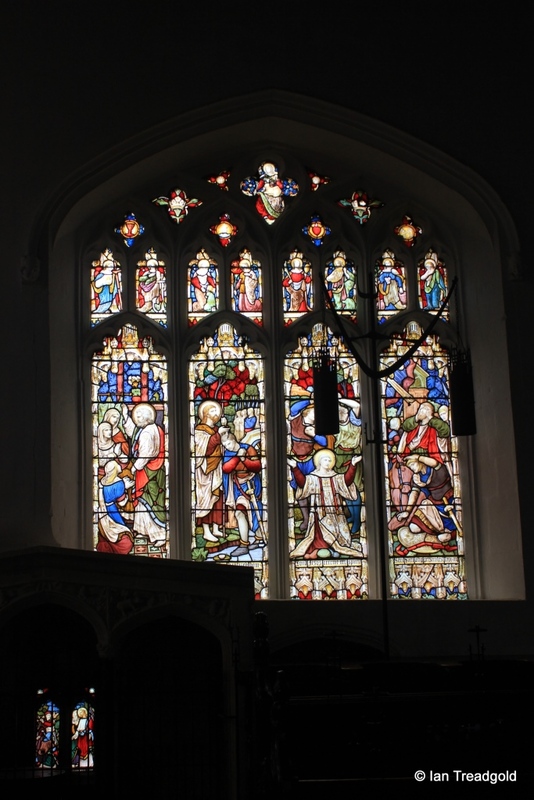 The eastern window is also of four cinquefoiled lights with perpendicular tracery and again features scenes from the life of Christ. 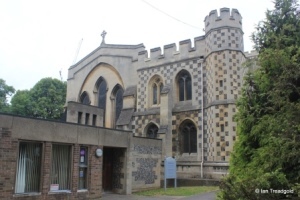 The east end of the church is obscured by the modern church hall and offices. 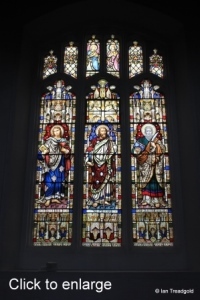 The original Georgian east window was replaced with the current arrangement in 1866. 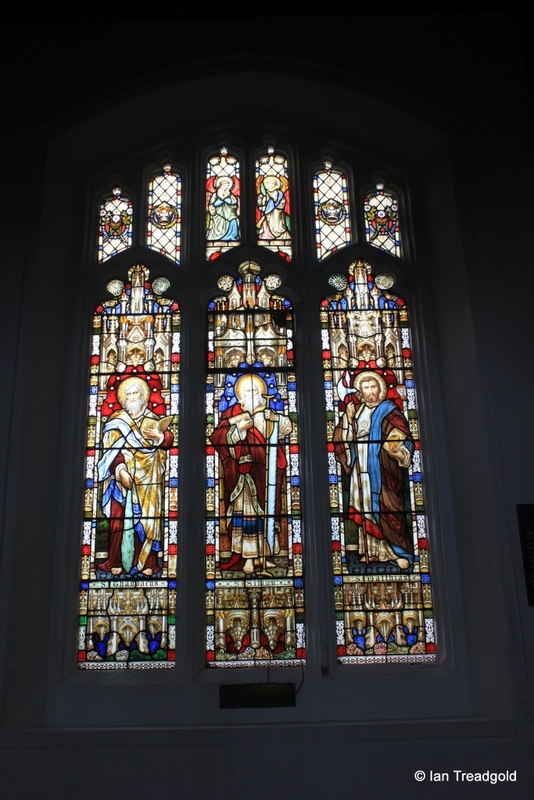 When first installed the windows was unglazed with the current glass being installed in 1874 at the start of a period of glazing throughout the church that lasted until 1886. 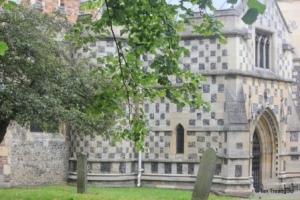 The vestry occupies the north eastern side of the chancel and is a two storey affair with a stair turret in the north-east corner. 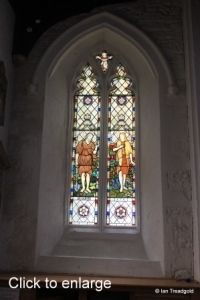 The Wenlock Chapel occupies the rest of the north side of the chancel and has an east window and two windows to the north. 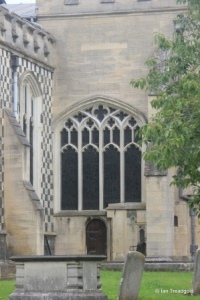 All are of the same style being of four cinquefoiled lights with perpendicular tracery above under segmental arches. 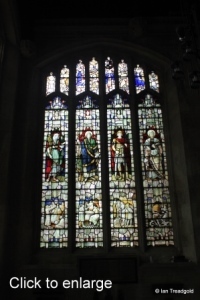 The east window of the chapel contains glass showing Joseph, Daniel, Judas Maccabaeus and Solomon with scenes below representing prudence, temperance, fortitude and justice. 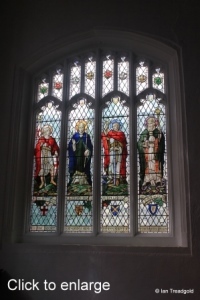 Of the north windows in the chapel the eastern shows Abraham, Moses, Job and Boaz with scenes representing faith, meekness, patience and chastity. 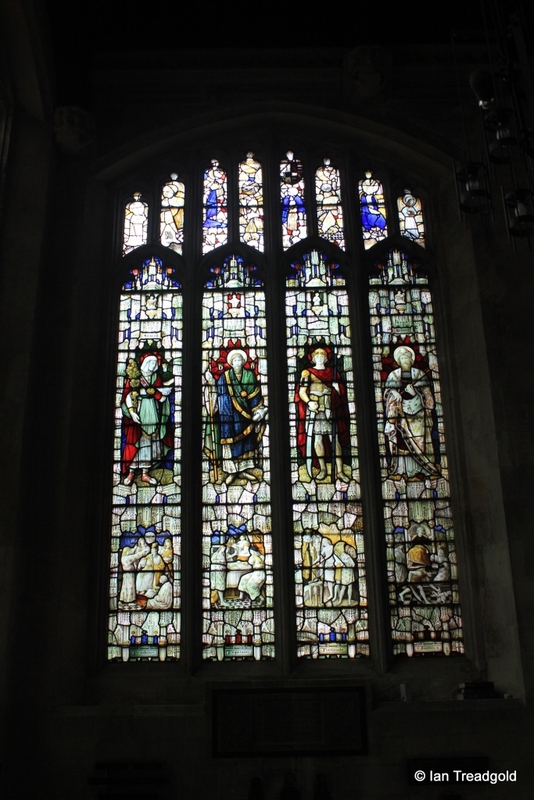 The western shows David, Miriam, Raphael and St Stephen with scenes representing love, joy, peace and longsuffering. 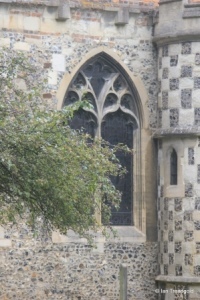 The north window of the north transept is of five cinquefoiled lights with perpendicular tracery above under a segmental arch. 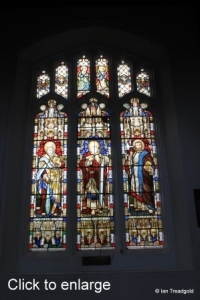 The impressive window is known as the O’Neill window after the Rev James O’Neill who became vicar in 1862 and oversaw much of the restoration work in the late C19. 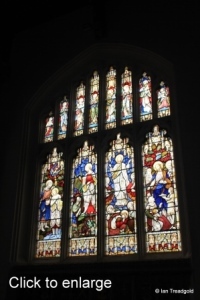 The window was erected in 1897. 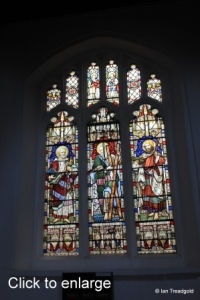 It shows key figures in the early life of the church, the first king of all England, King Athelstan; Robert, Earl of Gloucester; John de St Albans, the first perpetual vicar of Luton and Lord Wenlock. 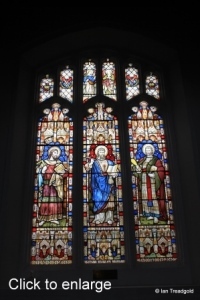 The centre depicts the arisen Christ. 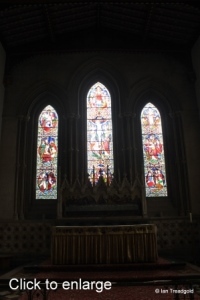 The west window of the north transept is of three cinquefoiled lights with perpendicular tracery above under a segmental arch. 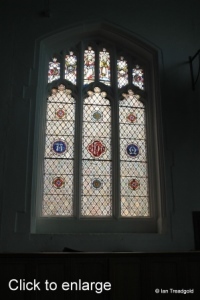 The window shows the symbols for alpha and omega around the Greek IHC for Christ. The north aisle has windows to match those on the south with three to the east of the north porch and one to the west. Each is of three cinquefoiled lights with perpendicular tracery under a segmental arch. 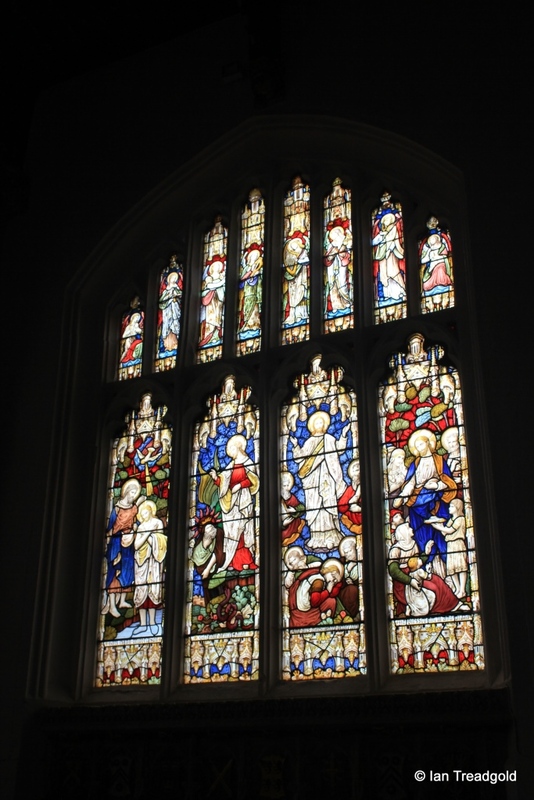 The windows depict twelve saints. From west to east; Peter, Andrew, James Major, John, Philip, Bartholomew, Thomas, Matthew, James Minor, Thaddeus (Jude), Simon and Matthias. 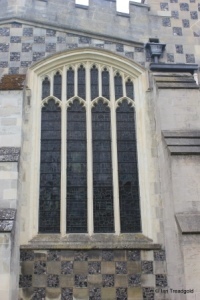 The modern west window of the north aisle is of two trefoiled lights with a large quatrefoil design above under a pointed arch. 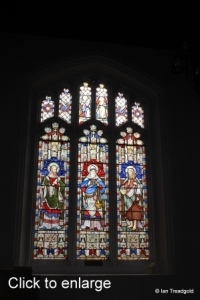 The glass in the window depicts Joseph and Mary. 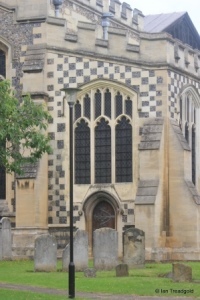 The north porch, like that on the south, is of two stories. 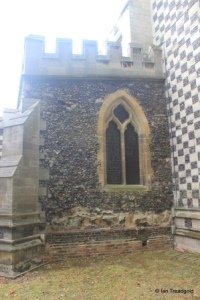 This porch does not have a stair turret and access to the parvise would have been via an internal staircase next to the north door. The staircase is no longer present leaving the porch door hanging incongruously above the north door. The west tower is of three stages and is embattled as is most of the church with the exception of the outer faces of the north and south transepts and the east end. 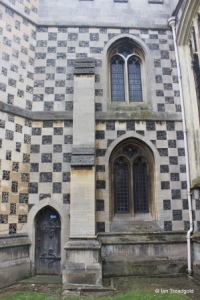 The tower has octagonal turrets at each corner with that in the south-east corner serving as the stair turret. There is a small pyramid roof in the centre supporting the weather vane. 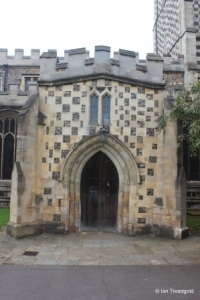 The belfry openings are of two cinquefoiled lights with a quatrefoil above under a two-centred arch. 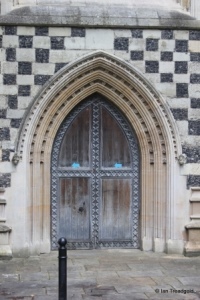 The modern west door is in C14 style with a two-centred arch with three orders of rosettes. 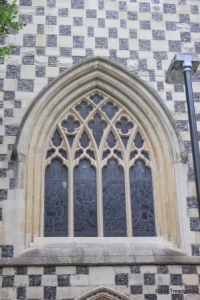 The west window is rather squat in height but is of four trefoiled lights with intersecting tracery above under a two-centred arch. 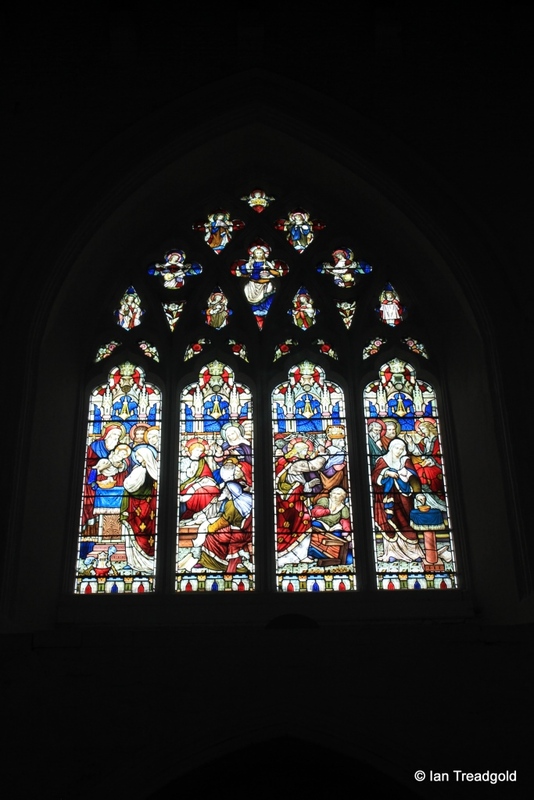 The glass in the window depicts scenes in the life of Christ and dates from 1887. Above the window again is the church clock with a face just to the west. 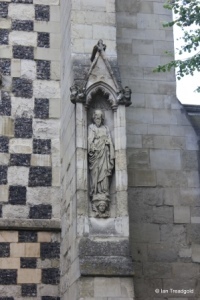 In the west facing buttresses there are four canopied statue niches containing, in varying degrees of preservation, statues of saints. 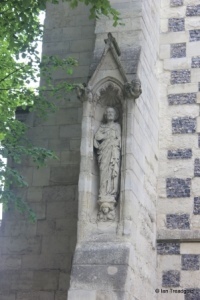 These statues were planned when the tower was restored in 1907 but only placed in situ in 1911-12 and have not worn well. 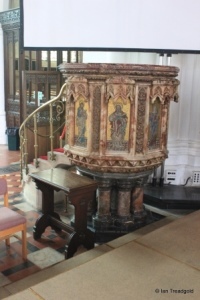 One of the gems of the church is the intricately carved octagonal Baptistry. Around 20 feet tall it was built around 1340. Each face has a traceried opening with sharply pointed gablets and large foliate finials. Between the faces on the angles are slender crocketed pinnacles. 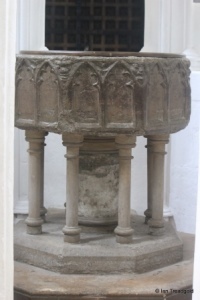 The font dates from the same period and is of Purbeck marble. The bowl is octagonal and stands on a central stem surrounded by slender shafts. 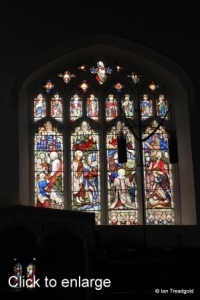 When the existing Someries Chapel was enlarged in around 1461 by Sir John Wenlock to form the present Wenlock Chapel by extending the existing chapel to the vestry, the wall to the chancel was pierced and a double arch inserted. Under the arches are tombs, the western tomb supposedly belonging to William Wenlock, Prebendary of St Pauls who died in 1392. 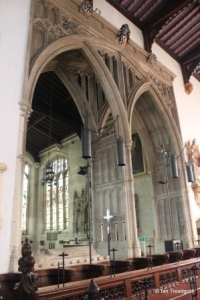 The original rood screen is now used to separate the Wenlock Chapel from the north transept. 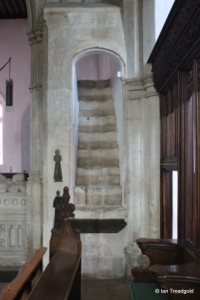 The rood stairs remain rising from the Wenlock Chapel to the height of the old screen now ending abruptly in mid-air. 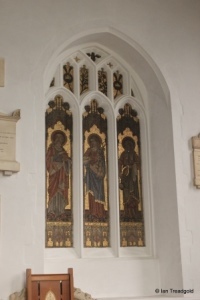 The reredos behind the chancel altar is a Venetian mosaic framed in alabaster. 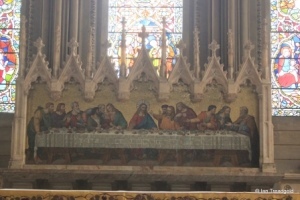 The mosaic depicts da Vinci’s painting of ‘The Last Supper’. 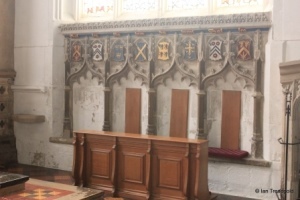 To the right of the altar is an unusual four seat sedilia with ogee heads and shields above. 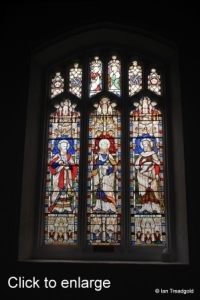 When the upper storey of the vestry was added, the north window of the chancel was blocked and a mosaic inserted depicting St Mary Magdalene, St Mary and Mary, mother of James. 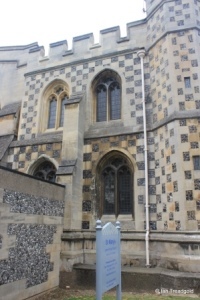 Low down on the south side of the chancel is the Barnard Chantry. 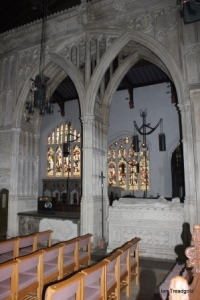 It is set below the current level of the Chancel and whilst its full purpose is not known it is likely that it was intended as a tomb for Richard Barnard who was Vicar between 1477 and 1492. 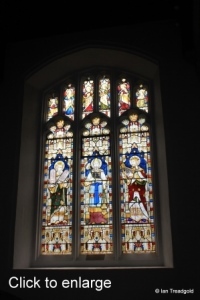 Within there is a small single lancet window and a two-light window with stained glass. 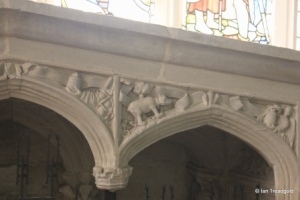 Above is an ornate carved canopy with images of chained bears and other figures. 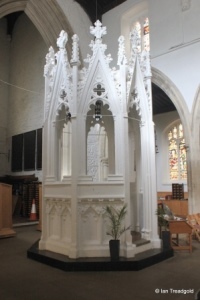 The pulpit dates from 1882 when it was presented to Rev O’Neill in celebration of 20 years as vicar. 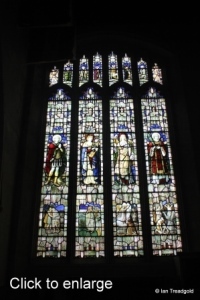 It is of marble and the panels depict the Gospel Saints along with Saint Paul.